A-1 Merchant Solutions, a partner of CCBIZPro & Integrity Payment Systems, has imagined it, and has made it available in ROAMpayTM! A-1 Merchant Solutions, a partner of CCBIZPro & Integrity Payment Systems, knows when a merchant is capable of giving customers the option to pay through a cell phone app, that merchant increases the number of immediate sales on the spot! For many merchants, mobile technologies have become vital to business growth, operations and reducing collections. Offering mCommerce has proven to be a good business decision, a convenience to the customer, and its ease of use helps with retaining business. As mCommerce has expanded and grown, technology applications have grown as well from small square cumbersome technologies to Intergity’s ROAMpayTM. ROAMpayTM is an advanced mobile commerce platform with turnkey and custom apps that enable merchants to sella product or service safely and easily utilizing a cell phone or mobile device. Simply swipe the card, enter the amount and let the client sign for the transaction with their finger. It automatically sends the customer an email receipt and allows you to capture the email for further promotion. The ROAMpayTM mCommerce platform can be used on hundreds of different devices; the swiper is compatible with almost all iOS devices such as the iPhone, iPad and iTouch, and it supports almost all of the most popular Android devices such as a Droid. Integrity’s ROAMpayTM reader provides a more robust read and is more secure than any other solution on the market. It also allows merchants to use their existing mobile merchant account at their present rates. Additional features include email receipts to customers and a transaction history on the merchant’s phone, or online. In today’s marketplace, merchants who can fully respond to the mCommerce trend at the point of sale (POS) are the ones that will grow. In addition to the convenience and increased sales benefit for the merchant, customers find their shopping enabled, their experience improved and their needs satisfied quickly and easily. 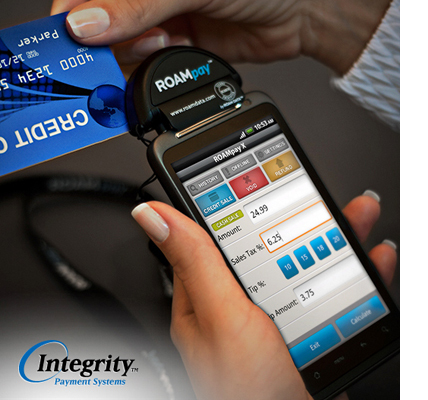 Visualize a salon or body shop being able to accept payments anytime, anywhere with Integrity’s ROAMpayTM, a mobile app, and a low-cost swipe-capable POS device. Whether you have a large number of employees, technicians or wait staff, the ROAMpayTM phone app supports multiple users on the same merchant account, making it a perfect POS device for larger companies too. ROAMpayTM responds beautifully to the needs of merchants who conduct their business on-the-go or within a brick and mortar retail establishment. With A-1 Merchant Solutions, a partner of CCBIZPro & Integrity Payment Systems, the security of a financial transaction is vital. Integrity’s ROAMpayTM POS swipe device fully encrypts cardholder data at the card reader before it reaches the mobile device. The data can then only be decrypted at a secure payment server. This helps merchants maintain PCI security while helping consumers feel that their card information is handled safely. Triple-DES encryption keeps transaction data safe. Please visit our ROAMpayTM FAQ page for more detailed information. We know you’ll be pleased! A-1 Merchant Solutions, a partner of CCBIZPro & Integrity Payment Systems, offers leading-edge technology, ease of use, tight security, convenience, low cost, and additional features to meet the needs of both the small business and the consumer. Call us today at 518-763-4000, and you’ll be up and processing tomorrow! To check on equipment compatibility visit http://www.roamdata.com/device-compatibility/.